Criminal charges have been opened against the six Ghanaian referees who were captured allegedly collecting bribe in the exposé by controversial investigative journalist Anas Aremeyaw Anas. 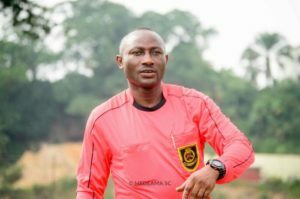 The damning documentary revealed how some GFA officials and officiating referees took money – including some collecting as little as GH¢200 ($42) – to influence the outcome of games even before the players marched onto the field. Some of the referees received sheep, goats and food items. The exposé has led to a halt on all football activities in Ghana with the government in court seeking the dissolution of the Ghana FA. Reports indicate that the referees were apprehended on Wednesday, but were granted bail with surety amounting to GH¢50,000. The identities of the referees and the charge preferred against them remain undisclosed. However, it is clear the Ghana Police is proceeding to build a docket over the accused to be forwarded to the Attorney General’s department for further prosecution. Meanwhile, CAF have issued several degrees of bans to the Ghanaian referees caught in the exposé.